Salt Lake City, Utah was the meeting site for thousands of cleaned up equine veterinarians this past weekend. I wore my new jeans but kept my comfortable cowboy boots on. The weather was a balmy 60 degrees and sunny. The news reports were complaining that the ski season could be a bust this year. I liked it though. 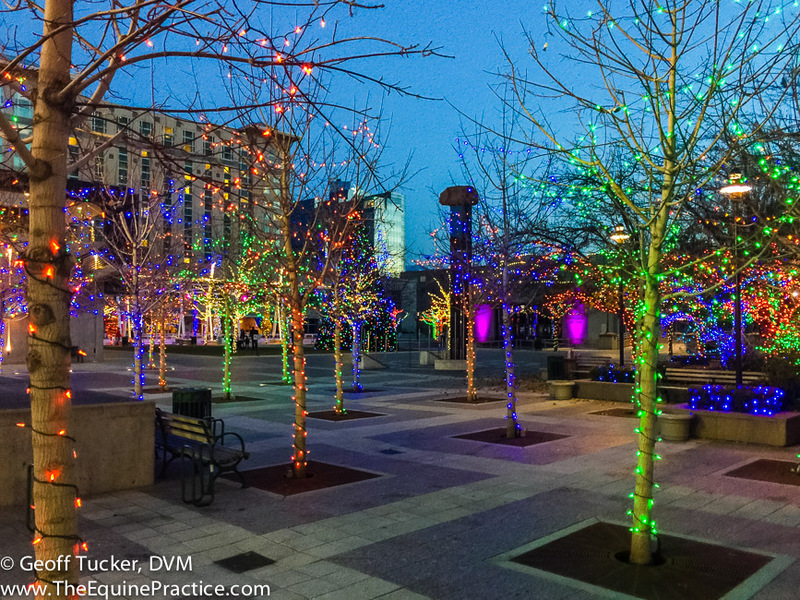 Salt Lake City, UT city park and ice skating rink in December, 2014 AAEP meeting. The trade show covered a football sized convention room and had all the toys every vet would want to buy for their practice. The dentistry lectures were more of a how-to discussion of equipment, sedation, and nomenclature. Nothing new was added to the knowledge base of disease other than no one has a clue why some older horses start to have their front teeth loosen and fall out. The official name for this condition is EOTRH which stands for equine odontoclastic tooth resorption and hypercementosis. There are two words I need to add to my computer’s dictionary. I have called it “ugly teeth of old horses” until this fancy name came along. The interesting fact about EOTRH is that everyone seems to agree that it is a “new” disease because there is no discussion of this in older text books or studies. People started seeing this about 15 to 20 years ago. Some were saying it may be caused by the grains we feed. Some suggested it is caused by vaccinations or dewormers. Other causes were bantered about but none held water. I had nothing to add either. However, it seems like no mini horses have had a case of this and it seems to only happen in geldings. I’ll keep my ear open for more news about this interesting disease of the front teeth of horses. 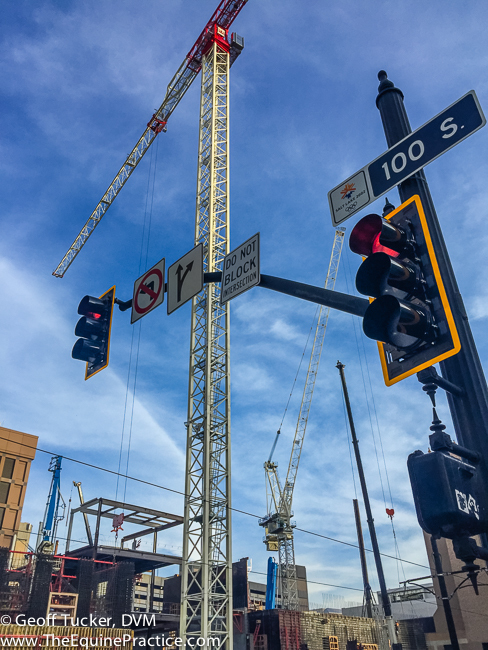 Salt Lake City, UT in December, 2014 AAEP meeting – the city skyline. Construction everywhere. There is nothing else to say about the meeting except it is frustrating to listen to the other veterinarians talk about equine dentistry as if the horse is just an object that needs to be immobilized through profound sedation and speculum use. Of the 150 veterinarians crammed into the room for the round table discussions, I felt that I was the only one who wants to work WITH the horses to clear up their dental issues. I am sure there are more vets out there who, like me, want to treat the horse as a living being with thoughts and feelings. Maybe you know of one. If you do, please let them know that I have a school teaching this method you all see me and Melissa do with your horses. Send them my way and let’s together preserve horsemanship based equine dentistry.